Fortnite has been ruling the gaming industry since they launched the Battle Royale feature, which has been admired by gamers and streamers all over the world. Fortnite looks after their player base and is constantly improving the gameplay experience to make the gameplay more enjoyable and to not let it be stagnant. 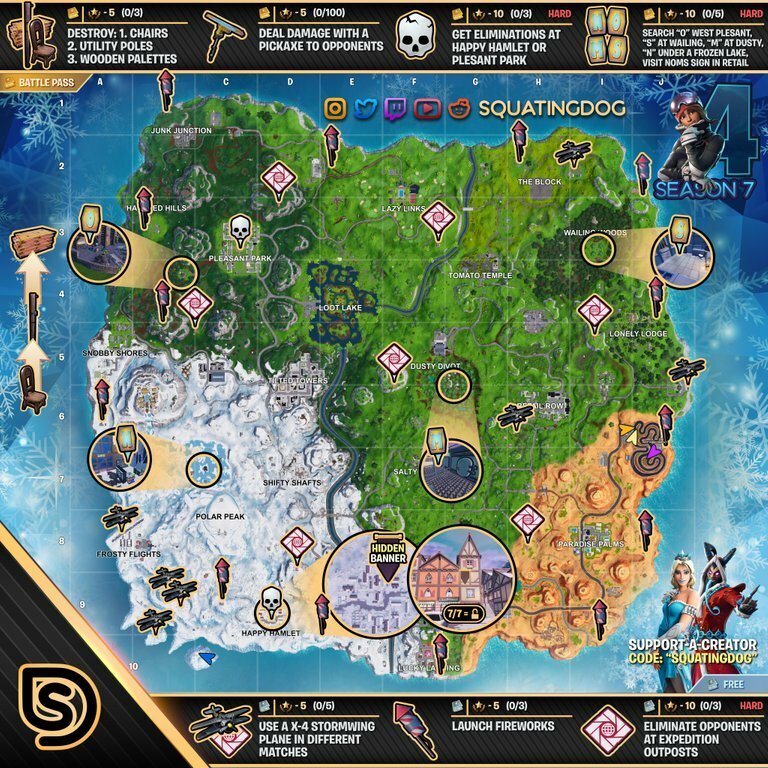 As Season 7 rolled up with it came new challenges and here is a cheat sheet that will prove immensely useful for you to complete this week’s challenges which were posted by Reddit user u/squatingdog. This week will probably see a lot of chairs being destroyed looking at the challenges presented by Epic Games and if you are looking for a place to get the most amount of chairs, check out the gaming room in Paradise Palms, shipping yard between Happy Hamlet and Lucky Lansing or Snobby Shores. If you would like to get kills near expedition outposts, it would be clever if you just start food fights until the objectives spawn near your location so that you can get the number of kills for this weeks challenge. Another tip for outpost kills is that it counts just your physical location, so you can use a sniper rifle to kill other players in a distance while staying at the outpost.